This took Dani aback. We have been known to experiment with all kinds of food here, but so far, guinea pigs have not made it to the frying pan. Indeed, I had warned our visitors that Dani was going to be using us as guinea pigs when she tested recipes for this season’s Goody Boxes (which is what we call our CSA program). Chard was the featured vegetable and we had a couple of dishes which were chard-centric, including a really tasty version of dolmades. Typically, one rolls yummalicious stuff inside grape leaves, but being short of those, it turns out large chard leaves make a perfectly acceptable substitution. Something was lost in translation when I explained all that and given that I’d gone to great lengths to explain some of the options we have been looking into for our protein box customers, it’s hardly surprising that we had a bit of a misunderstanding. Subscribers to our protein box this year can look forward to locally produced lamb, pork, turkey, duck, chicken, and various other unusual meats like rabbit, bison, venison, and ostrich (depending on availability). So far, though, the guinea pigs of Vancouver Island are safe – there are no plans to include them on the menu! 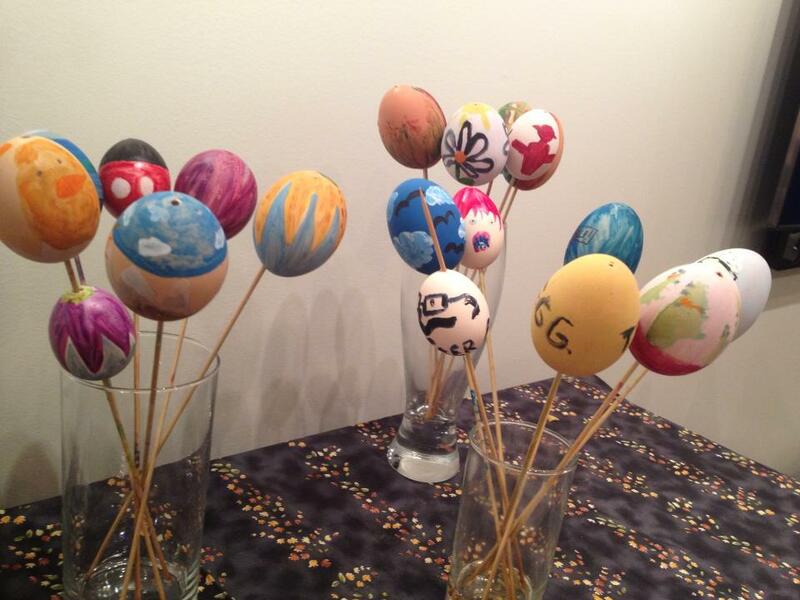 Tonight, after another delicious feast thanks to Dani and Toryn (Easter is a wonderful excuse to bake a ham …) we all painted eggs. 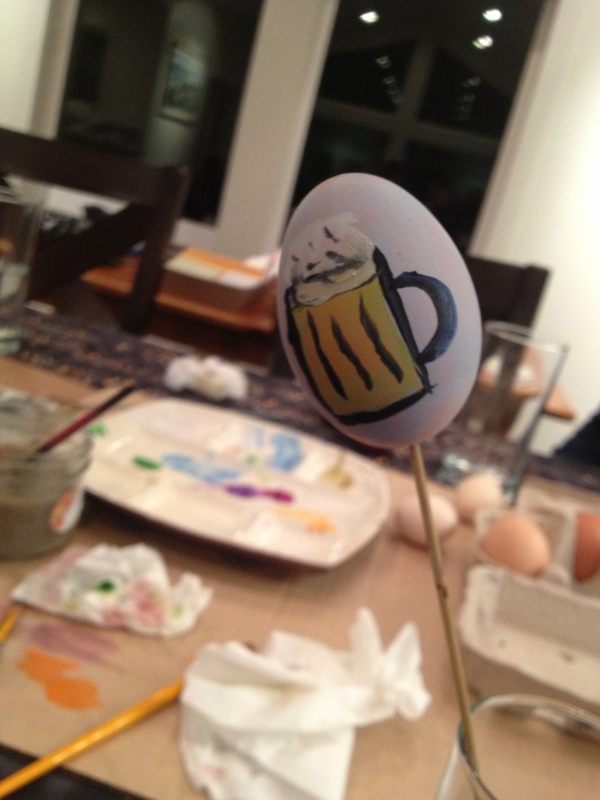 Perhaps inspired by the beer bread, LS painted this ode to ale on an egg, just one of many fab creations he came up with after the dishes were cleared and the paint and eggs came out. Everyone got into the act and before long bouquets of eggs were sprouting up all over the place! Yep. Spring is most definitely here! It is a mental block thing that people need to get over. Most who eat beef, pork, lamb, chicken, etc, don’t let the nature of the animal stop them. Some are strongly affected. Not most. Your eggs are nice. I like the beer mug. This is true, but people feel very strongly about what they will – and won’t – eat in the meat department. Food taboos and biases are fascinating to me – you would think that if it is nutritious, tasty, and edible people would be happy to consume whatever it might be. But, of course, nothing could be further from the truth! I can afford to be fussy on that count. But if I were in need, my standards would change and I’d be open to a lot wider range of resources. And, guinea huts would be smaller and easier to move than hog huts. Don’t you agree? I would definitely try dolmades made with chard! What a great idea. We’re looking forward to our produce CSA beginning. It’ll be at least a month before our portion begins, as we have signed up for summer produce. The small farm does also a spring option. Do you sell duck eggs? I have read recently that they are quite good. We do sell duck eggs – they are delicious, not so different in taste to chicken eggs, though the texture is different. They are thicker, more custard-y with a larger yolk to white ratio. Enjoy your veggies, once they start arriving! Lovely to meet you, I have given your blog a shout out from my letter T today. Keep blogging. I think there’s a chapter in one of Bill Mollison’s books (Permaculture One??) about grazing guinea pigs as part of a stacked forest garden enterprise. I don’t think he explicitly stated it, but it was clear to me at the time that they were intended for the pot at some point. They just seem a bit small for cooking, but really I guess they’re not a lot different from rabbit, and I sure enjoy a bit of that occasionally. Food taboos ARE fascinating. Consider horse and dog meat for example. Foie de gras….